Pictured here are some of the members of the initial working group that formed the plans for the DLL. First row (from left): Jim Ginther (St. Louis University), Michael Gagarin (University of Texas), Bob Kaster (Princeton), Kathleen Coleman (Harvard), Tom Elliott (NYU-ISAW). 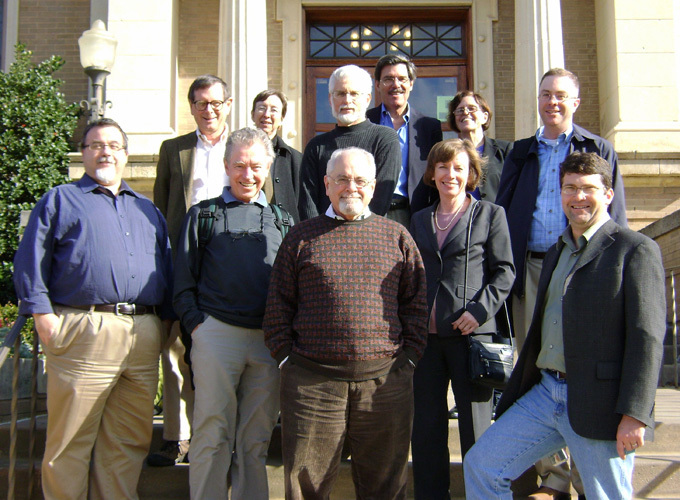 Second row (from left): Roger Bagnall (Columbia University), Cynthia Damon (University of Pennsylvania), Sander Goldberg (UCLA), John Miller (University of Virginia), Diana Robin (Newberry Library), Sam Huskey (University of Oklahoma). Not pictured: Hugh Cayless (Duke University), Jeffrey Henderson (Boston University), and Jim O'Donnell (Georgetown University).